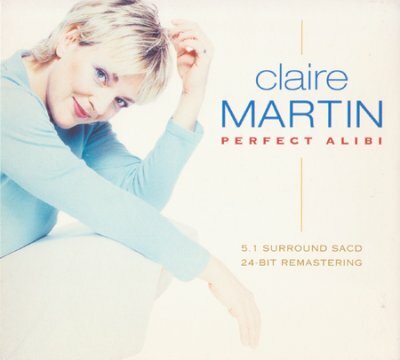 Claire Martin’s venturesome new album Perfect Alibi works just like the title says. Some might consider it too eclectic, but I don’t think so. Here, she uses her jazz sensibility to color such items from the pop/rock repertoire as Phoebe Snow’s deliciously devious Inspired Insanity, Al kooper’s More than You’ll Ever Know & Laura Nyro’s He’s a Runner. What she takes, she makes her own, as in her PhantomBlotic rendition of Jimi Hendrix’s Up from the Skies that smolders in a way that is filled with the passionate urge to transcend earthbound existence through love. Claire leaves Jimi’s song more memorable than she found it. A highlight here is the presence of guest co-vocalist & songwriter John Martyn. His duet with Claire in Man in the Station really resonates with desire, pain, & regret. Another definite plus is the contribution throughout the album of Paul Stacey, who plays damn near everything than can be plucked or strummed – electric, acoustic, & bass guitars, sitar, dobro, baritone & ebow guitars – & invests every song with just the perfect sound. Credit also the key backup support of Jeremey Stacey on drums; Anthony Kerr, vibes; Mornington Lockett, clarinet & saxophone, Luis Jardim, percussion; & Arnie Somogyi, double bass. The presence of strings, heard as either a single or double quartet & played in blues/jazz style rather than a strict classical idiom, adds a special quality to the mood of many of these tracks. Listen to the way the brown-hued acrid harmonies interplay with the vocal lines in the poignant yet hopeful Strangers Now (Martin/Somogyi) & the crisply articulated Over by Allenby (Comfort), & you’ll hear what I mean. And Miss Martin’s vocal versatility can, as required, bleed right into the instrumental line, as it does in the final measure of Todd Rundgren’s Wailing Wall, where it whites out in the sound of Robin Aspland’s organ accompaniment rather than fade to black. An impressive singer, Claire Martin. Some consider her the best all-around British vocalist since Dusty Springfield. Who am I to say nay?